As greener transport has become more popular, electric vehicles are now becoming available in different shapes and sizes. Consequently, the Tesla Semi is the next step in this technological upheaval. The electric heavy-duty truck doesn’t commence production until 2019, but we thought it would be worth looking at what we can all suitably expect for the future from what we know so far. Obviously, the ambition of Tesla is enormous here. Fuelling bigger transport this way takes an enormous amount of power and ingenuity. Before we review the consequences, it’s worth looking closer at exactly what the Tesla Semi offers. Tesla’s website boasts the extremely impressive technical capabilities of the new vehicle. 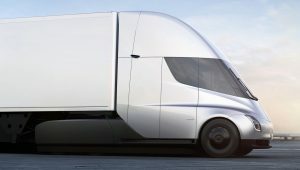 The Tesla Semi is looking at achieving a ground-breaking 0-60 acceleration rate for a vehicle of this size, while also including a full cargo. Additionally, there is a 300-500 mile range before requiring another charge, while the energy consumption is less than 2kWh per mile. This is far lower than the standards for other trucks, causing an estimation of $200,000+ in fuel savings over a two-year payback period. So far, so good. Safety is obviously a huge focus from Musk’s statement, which is much needed due to a recent rise in truck fatalities across the globe. One way the Tesla Semi stamps out the likelihood of accidents is by providing the truck with a lower centre of gravity; meaning that the truck is far harder to roll over. Additionally, there is an enhanced autopiloting system embedded in the cabin, especially designed to prevent collisions. Moreover, emissions are obviously cut down due to the vehicle being powered by electricity, meaning that the environment is safeguarded as a result. Crashes are minimised, and the air becomes cleaner, boasting great results all round in the safety department. The next level lorry would no doubt do wonders for the delivery business too, perfectly poised to give courier services a new and sharper edge. This likely ties into the ‘fun’ aspect of the Semi, with touchscreen pads in the driver’s seat to assist in connectivity and navigation. Technically, the driver could engage the autopilot function and map out their most suitable route without having to pull into a layby or service station. Ultimately, the Tesla Semi saves time, money and perhaps even lives from the safety and environmental functions. No doubt in a few years the roads will be full of them, and it will take a few more to set aside the wonder of it all.